Hundreds of illegal taxicabs dash between Prishtina and Fushe Kosove, providing commuters with a faster transportation option, and seasonal workers with a means of subsistence. Daily commuters between Prishtina and Fushe Kosove are familiar with this image: you are waiting at a bus stop, minutes tick by, and instead of a bus, a nondescript car pulls up. The driver raises his index finger to indicate he is driving through bus route 1. You hop on, squished between other passengers picked up along the route, and for a mere 50 cents (just 10 cents more than the bus fare) you whizz through the tedious road that connects Prishtina and its de facto biggest suburb. Yet, what these drivers are doing is illegal. Most of the people working on this route do so because of the lack of job opportunities or the insecurity of their current jobs. Although informal taxis run through some of the 27 bus routes currently available to people who commute to Prishtina, route 1 connects the capital to its biggest suburb, the rapidly-growing municipality of Fushe Kosova. On a clear winter day, I was waiting at the bus stop next to the university campus when a taxicab pulled up. The driver, Halit, was a man in his 30s who played Albanian pop and R’n’B CDs, saying he did not like listening to the news on the radio. Like most of taxi drivers I met researching this story, Halit is reticent and gets angry when cars slow down in the perpetual traffic jam between Prishtina and Fushe Kosove. In September 2017, Halit was fined 50 euros and his car was confiscated for three days for operating illegally. But Halit might have just been unlucky: there are dozens of fines and confiscations of vehicles, in contrast to hundreds of cabs. This is mostly due to the lack of inspectors: in Prishtina, inspectors divide their time covering various sectors, while in Fushe Kosova there is only one permanent traffic inspector. If, as the regular taxi drivers claim, there are hundreds of informal taxis roaming the streets, it is impossible to catch them all. Efforts to police informal taxi drivers in the capital are expected to increase, however. According to Brahim Mehmetaj, head of the directorate for inspection at the Municipality of Prishtina, if the city gets its own police force, as the yet unratified Law on the Capital foresees, officers would also be tasked with policing informal cabs. “Illegal taxi cabs cause traffic congestion and financial damage to urban transportation companies,” explained Mehmetaj. At the moment, 18 privately- and publicly-run buses traverse route 1. “As a result of illegal taxis which pick up passengers, and even overtake buses to pick these up, buses fill up only 50 per cent,” said Ismail Kokaj, the head of the directorate for public services at the municipality of Prishtina (taxi drivers say it is bad luck to have a bus in front). Taxi drivers registered in Fushe Kosove also work on route 1 to make ends meet, explained the Auto Taxi Assocation. | Photo: Atdhe Mulla. According to Afrim Krasniqi, head of the inspection in Fushe Kosove, this municipality is also undertaking a major initiative to register taxicabs which currently operate without permits. In Fushe Kosove, drivers need to provide ID, a driver’s licence, car documents, a business certificate and a residence certificate to get a permit. Registered taxi drivers pay a 40 euro municipal tax. In Prishtina, the criteria are a bit different, and they do not pay tax. Afrim Krasniqi, the director of inspection, however, is less optimistic that the numbers of illegal taxis will drop, as “harsh economic conditions” are the main reason why these drivers work on the route to begin with. Most of the drivers on this route drive back and forth between Prishtina and Fushe Kosove seven to eight times a day. Their earnings amount no more than 20 euros, ten of which are spent on gas. In his car as we drove towards Fushe Kosove, Halit told me he also works in construction during summer. Amongst his seasonal jobs, he prefers driving the least. “This job hardly covers my everyday expenses. Some days I cover the route seven or eight times, just like this: with a single passenger,” he added. 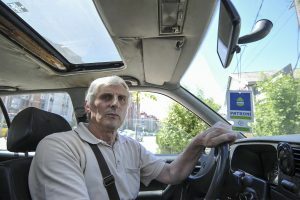 Another taxi driver, Ilir, a 56 year-old who had been driving for seven years, called the job a “merr-jep,” Albanian for give-and-take, saying it was not really profitable. Ilir, who said he was a registered taxi driver but carried no sign or permit, said that he worked as a construction material transporter in the summer, and that he often thinks of changing jobs. Vehbi Maqastena a translator, singer and sharkia player, started driving a cab after failing to find work. | Photo: Atdhe Mulla. The Fushe Kosova Auto Taxi Association, representing registered individual taxicabs –some of whom also operate illegally between Fushe Kosove and Prishtina — claim that the illegal taxi drivers harm the industry and complain there are too many of them. A member, Besnik (who withheld his surname), even argued that there were eight times more informal cabs than those with permits. 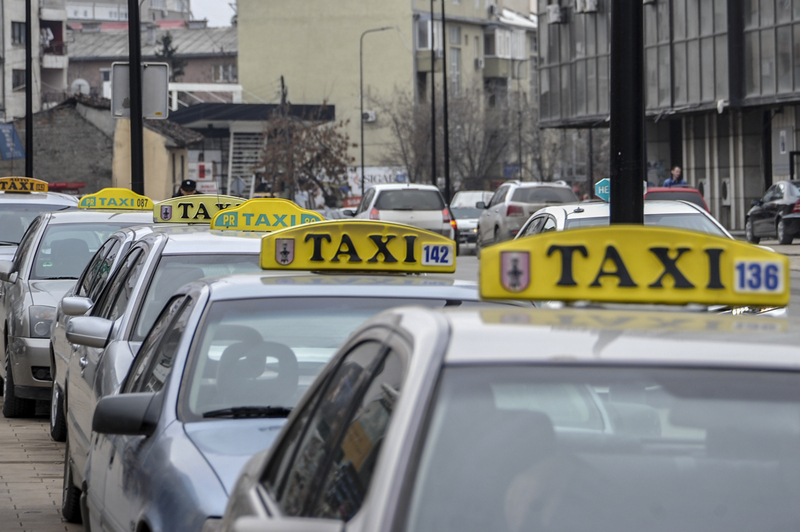 The municipalities of Prishtina and Fushe Kosova do not have accurate numbers, but agree that hundreds of cabs operate illegally. Besnik, who is registered in Fushe Kosove and also drives on route 1, said there were benefits and security to registration. “People who have work permits also get lower fines, up to 100 euros [for operating outside their registered limits]. But, without permit, the fine goes up to 800 euros,” he added. Although he would potentially get a lower fine in Prishtina for waiting at a bus stop, he too is careful to not loiter long at the bus stops. Afrim Berbatovci, the head of the taxi association, blamed the large numbers of ‘illegal taxicabs’ for making the life of registered taxi drivers more difficult. On my way back from Fushe Kosova to Prishtina, I met Vehbi Maqastena, a 60 year-old driver, singer and sharkia player. He claims to be an excellent Serbian to Albanian translator, but after failing to find work, he has worked as a taxi driver for ten years. “I used to own a cafe then a betting store, but the business didn’t go well so I started working as a taxi driver,” Maqastena recounted. Correction May 2, 2018: A previous version of this article mistakenly attributed Afrim Krasniqi’s quotes to Maliq Berisha and also linked to the Law on road traffic provisions instead of Law on road transport. A previous version also claimed that there are 16 bus routes operating in Prishtina. According to the Municipality of Prishtina there are 27 active regular bus routes that connect the capital to suburbs and neighboring municipalities.